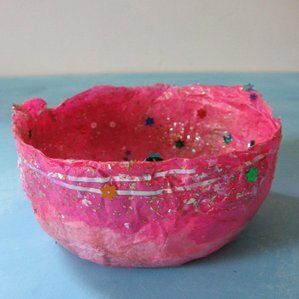 Get them to make papier mache bowls. 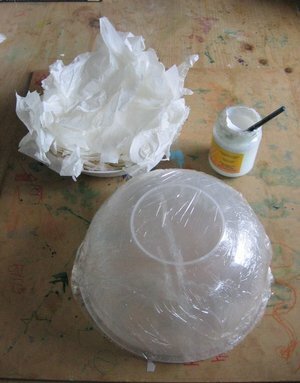 Cover bowl with lots of layers of tissue paper, and leave to dry. You can speed things up by cooking it in the microwave, but check it every minute or so, otherwise it will scorch/catch fire ( I speak from experience). When dry, paint with acrylic paints if desired. Or leave it white - it will have a lovely translucency. 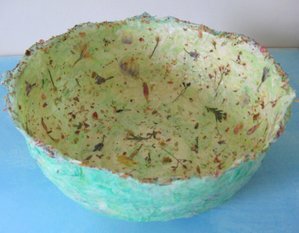 Apply another layer of glue mix to the inside of your bowl, and decorate with pressed flowers. I've also scattered the dusty bits from the bottom of my bag of dried rosebuds, to give it a 'summer meadow' look. 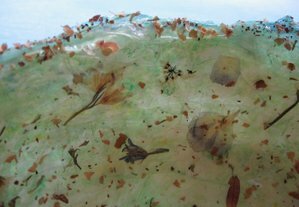 Alternatively, use coloured tissue paper and decorate with sequins/glitter/pretty threads/stickers or beads. Leave to dry, and then apply another couple of coats of glue inside and out. Beautiful. Now they are made and on display, are the children back in the cupboard? What a great idea! We usually use a blown up ballon, but the cling wrap bowl is a great idea especially for my 2 year old. Thanks! hey -- great idea! but what if one has already locked oneself in the cupboard? 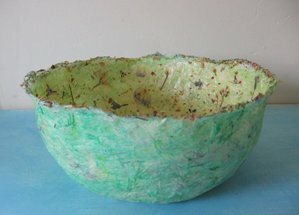 i used to make paper mache bowls!! the title of this post made me crack up. You give the best tutorials. I just love this idea, maybe I'll get my kids out of the cupboard and try it! Lovely...this might just be worth letting him out of the cupboard for! I think we will make the pink one!! Ha Ha!! I'm having a "lock your kids in the cupboard" kind of day, so this is good timing! This is a wonderful idea. So simple and pretty! It would have been good for the day the kids decided to tear apart a whole box of tissue!ha ha! Very cute! I love the pressed flowers idea. Wow - that's amazing! But I'd really rather lock my kids in the closet. Thank you for the great idea...I don't know if I'll use it as an 'alternative' but will definitely get them (the little darlings) to try their hands at it. The bowls are beautiful! Love the pink bowl! Do you seal it somehow so the glue doesn't get sticky if it gets wet? Wonderful!! and I love the pink!! That is the greatest idea! My daughter will love this. Thank you. great bowls, makes me want to go tear up some paper...they are lovely! haha! i will have to save this idea for when my little guy is a bit older. for now, we're at the stage where he can annoy the snot out of me, but he can only be entertained with something for about 10 minutes at a time. sigh. oh my. you have a beautiful site and such beautiful things you've made. Where do you find all your beautiful fabrics (for patchwork, sewing and corsages) in the UK? I live in London and the only place I can find nice fabric is in Liberty where the prices are sky-high. Those are beautiful!! I love them!!! I am going to have to try this!! Thanks for sharing. They look lovely but surely its still easier just to lock the children in a couboard and have a bottle of wine? They look lovely, we love paper mache in our house, lovely and sticky and messy. We just use flour and water. This looks like a lot of fun for a kid's project! Thanks for sharing! one of my favorite art forms! Thanks so much for your tutorial. I think I know what we'll be doing this weekend! Wonderful technique tips and great photos for each step... Thanks for sharing! I followed a link from The Crafty Crow! Beautiful work and a wonderful idea. They look like they should be in an art gallery. I can't wait to give these a try. Great idea!!! I do have a question. Can you put a coat of poly or something similar to protect the mache? Or does the coats of glue protect it just fine?